Steve Balich Editors Note: While there are times investigations are necessary, it is illogical to give a prosecutor the ability to go after anything outside of a set parameter. The prosecutor decides the parameters and spends time and money like Mueller on so much outside of Russia working for Trump in the 2016 Election. The process is corrupt since the taxpayer is paying millions to finance a witch hunt with convictions riddled with abuse of power, offering prison for life and investigations of family members or saying what is necessary to make the prosecutors narrative seem true. In the case of Trump Clinton not Trump paid the Russians for “not true” information to let the DOJ and FBI Spy on the Trump Campaign and then to start the current investigation. No investigations should be allowed to go out of the scope of what was stated as the reason to investigate. If the reason to investigate is false the investigation needs to be terminated. Mueller needs to be stopped. A new investigation into donations to the Clinton Foundation, selling our Uranium to the Russians, Clinton paying the Russians for false information, the cover up by the heads of the FBI and DOJ, and abuse of power by the Mueller investigation. Here is the scope based on actual crimes not unsubstantiated facts like being used by Mueller as a possible crime. Democrats and a few Republicans—most notably among the latter outgoing Sen. Jeff Flake of Arizona—have pushed legislation to protect special counsel Robert Mueller from being fired by the president. For his part, President Donald Trump has repeatedly insisted he doesn’t intend to fire Mueller. Still, critics of the president are not convinced. The legislation isn’t likely to pass, however—and if it did, it would likely face a presidential veto, along with questions of its constitutionality. The concern about the fate of the special counsel has historical precedent. Three former special prosecutors—including the first—were sacked. In early 1864, as the Civil War raged, Sen. John Henderson of Missouri was among the first to draft a constitutional amendment to abolish slavery. The Virginia-born Henderson, a former Democrat, represented in the Senate what was then considered a Western state, Missouri, which both the Union and Confederacy claimed. So, his backing was important political symbolism. The 13th Amendment was ratified by the states in late 1865, well after the end of the Civil War and the assassination of President Abraham Lincoln. In 1868, Henderson was on the outs with his party after he and six other Senate Republicans voted against removing President Andrew Johnson from office. The House had impeached Johnson, a Democrat, for violating the Tenure of Office Act. After leaving the Senate, Henderson found himself again in the national spotlight. In the early 1870s, President Ulysses S. Grant, a Republican, was having problems with his party after scandals had piled up among his appointees. Among Grant’s problems was appointing former military officers to key administration positions—namely, former Civil War Gens. Orville Babcock and John McDonald. He had sent McDonald, the revenue supervisor with the Treasury for the St. Louis area, to shore up political support. McDonald established what came to be known as the Whiskey Ring. It began as a scheme among federal bureaucrats working with whiskey distillers to skim revenue from sales and divert the money to Republican political campaigns. The ring operated mostly in St. Louis, Chicago, and Milwaukee. Grant was re-elected in an 1872 landslide, and down-ballot Republicans did well. The ring was no longer needed for political purposes, so, starting in 1873, the bureaucrats and distillers continued the ring to line their own pockets. Because of a separate scandal, Treasury Secretary William Richards resigned. Grant named Benjamin Bristow to replace him in June 1874, and Bristow found out about the ring going on in his department and demanded an investigation. It was first handled through federal prosecutors in Missouri, who made 300 arrests—including of McDonald. However, as more ring participants began to talk, it became a White House scandal, with the alleged involvement of Babcock, the president’s personal secretary. Babcock had served with Grant in the Vicksburg campaign and accompanied him to Appomattox Court House, where Gen. Robert E. Lee surrendered at the end of the Civil War. So, Grant made him his personal secretary in the White House. However, because of the obvious conflict of interest, in June 1875, the Grant administration named Henderson to the position of special U.S. attorney for St. Louis to exclusively investigate the Whiskey Ring. Henderson is widely viewed as the nation’s first special prosecutor. McDonald and Babcock were said to have communicated through coded telegrams about preventing the investigation. Henderson secured an indictment against Babcock in December 1875. Babcock told Grant the prosecution was political, that Henderson was untrustworthy, and that Bristow, the Treasury secretary, was ambitiously seeking the presidency in 1876. During a closing argument in the trial of a low-level ring member, Henderson began talking about the Babcock indictment and said that it’s not likely Babcock could have been involved without Grant’s knowledge. Grant ordered the firing of Henderson. Under pressure, he replaced him with James Broadhead, part of the prosecution’s team and a future member of the House of Representatives. By comparison, continuing the Russia probe without Mueller might well be a taller order, historian and author David O. Stewart told The Daily Signal. “To make any assumptions this administration is operating on precedent is risky,” Stewart said. Grant became the first president to testify in a criminal trial on behalf of his friend Babcock, as prosecutors and defense attorneys traveled from St. Louis to the White House in February 1876 to take the president’s deposition and cross-examine him. Defense lawyers read the transcript of the president’s testimony in the St. Louis courtroom, which was compelling to jurors. A jury acquitted Babcock, but he had to resign from the White House. Broadhead completed the investigation that ended with 110 convictions and more than $3 million in recovered tax revenue. In some respects, the events of 1952 were the flip side of events of 2018 when a president, Trump, fired his attorney general, Jeff Sessions, in frustration over a special prosecutor’s investigation. Sessions had recused himself and took a hands-off approach to the matter. In President Harry Truman’s final year in office, he ultimately fired his attorney general for not supporting the special prosecutor. Initially, congressional committees investigated cases of what appeared to befavoritism, bribery, and theft of taxpayer dollars by the Bureau of Internal Revenue. The findings resulted in 66 individuals dismissed, and nine went to prison. Truman on Feb. 1, 1952, appointed Newbold Morris as the special assistant to the attorney general for the purpose of exclusively investigating Justice’s Tax Division. McGrath, a former Democratic senator and governor from Rhode Island, was reportedly unhappy about the appointment of Morris, a Republican and former president of the New York City Council. A descendant of American revolutionary Gouverneur Morris, the new special prosecutor had also twice been the Republican nominee for mayor of New York in 1945 and 1949, losing both times. Truman, a Democrat, reportedly was comfortable with a Republican investigator because he had sought an independent investigator. Morris sent out a questionnaire to Justice Department employees about potential involvement in corrupt activities regarding the tax scandal. Morris ran the questions by the president first. Truman approved, but McGrath did not. That turned into an irreparable wedge between the president and his attorney general. McGrath fired Morris on April 3, 1952. Truman immediately fired McGrath after finding out. After his firing, Morris returned to New York City, and was appointed parks commissioner. After Watergate special prosecutor Archibald Cox was ousted in October 1973, many on his prosecution team feared all their work and the case they built was over, recalled Nick Akerman, a former Watergate prosecutor, now in private practice in New York. Akerman said it’s tough to know if the Russia probe would continue if Mueller were fired. Easily the most well-known case of an ousted special prosecutor comes from the most consequential political scandal in American history; namely, Watergate, which led to the resignation of President Richard Nixon. Nixon had not been a fan of the Kennedy family since the 1960 election, which he lost under questionable circumstances. President John F. Kennedy named Cox, a former Senate aide, as the U.S. solicitor general, a top Justice Department role charged with arguing for the administration in front of the Supreme Court. 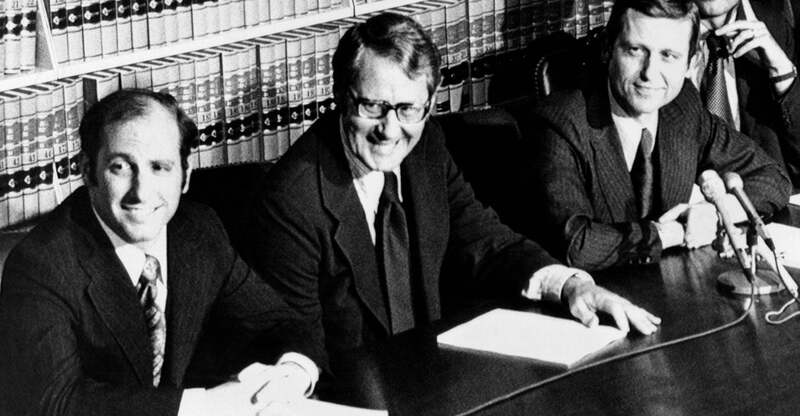 In 1973, Nixon’s attorney general, Elliot Richardson, named Cox as special prosecutor for the Watergate investigation looking into the break-in at Democratic National Committee headquarters, which expanded into other aspects of the Nixon administration. Nixon ordered Cox’s firing on Oct. 20, 1973. At that point, both Richardson and Deputy Attorney General William Ruckelshaus resigned, rather than carry out the order. But Bork named Jaworski to replace Cox and continue the investigation, which eventually led to Nixon’s resignation to avoid an impeachment vote in the House and trial in the Senate.